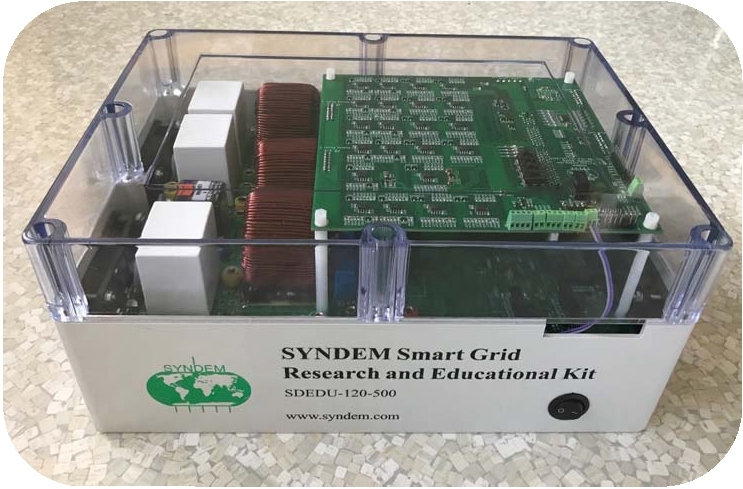 The SYNDEM smart grid research and educational kit is a multifunctional power electronic converter. It can be used to facilitate research and education in grid integration of various renewable energy sources, such as solar power, wind power, and energy storage systems, and flexible loads. The kit can be reconfigured to obtain 10+ different power electronic converters, versatile for different applications with one complete educational platform. It adopts the widely used Texas Instrument (TI) C2000 ControlCARD and is equipped to use the automatic code generation tools of MATLAB® and Simulink® and TI Code Composer Studio™ (CCS), making it possible to generate experimental results suitable for IEEE Transactions papers within hours of simulations. The kit includes Simulink blocksets covering all the hardware interfaces (e.g. voltage & current sensors, PWM, DAC, switches, relays, LEDs), interfaces for data monitoring and logging (e.g. RS485, CAN) and example Simulink control models which users can easily adapt to their own control algorithms. The primary end users are researchers, educators, and students. The product can also be integrated into other prototypes to reduce the development cycle of other products. The applications cover smart grid, renewable energy, storage systems, electric vehicles, motor drive systems, microgrids, etc., where power electronic converters are needed.